Kathmandu city sightseeing is one day tour inside Kathmandu Valley. During the tour, you will be taken to visit Pashupatinath Temple, Bouddhanath Stupa, Swoyambhunath Temple, Kathmandu Durbar Square, and Patan Durbar Square which are listed under UNESCO World Heritage Sites. All these attractions are the live witness of Nepal's ancient history and a great place to explore the wood architecture. Pagoda, Dome, and Shikhar style temples are the three various types of temples covered in this Kathmandu local tour. Pashupatinath Temple is a sacred Hindu Temple of God Shiva located in the north-east part of Kathmandu Valley. The Jyotirlinga at Pashupatinath Temple is considered as the head while rest twelve Jyotirlinga of India is as the body part. There are lots of small temples and ashrams raised over the centuries around Pashupatinath Temple. The main temple is two storey pagoda style architecture temple and was erected in anew the 15th century by Lichhavi King Shupuspa after the previous building was consumed by termites. Boudhanath Stupa is a dome style architecture temple located at the northeastern outskirts of Kathmandu. It is one of the largest spherical stupas in Nepal and worshiped by Buddhist. Earthquake in April 2015 badly cracked the dome and was completely rebuilt on October 2015. Swayambhunath Temple is an ancient religious dome style stupa situated at the hill station to the west of Kathmandu city. As per the history, Kathmandu was once filled with an enormous lake. And in the center, a lotus grew forming Swayambhunath. The temple is also known as the Monkey Temple as there are lots of monkeys living in the forest. Kathmandu Durbar Square is the old royal palace of Kathmandu Valley. Around the Durbar Square, there are lots of pagoda style temples like Kasthamandap Temple, Traikya Narayan Temple, Basantapur Tower, Taleju Temple, Indrapur Temple and many more. 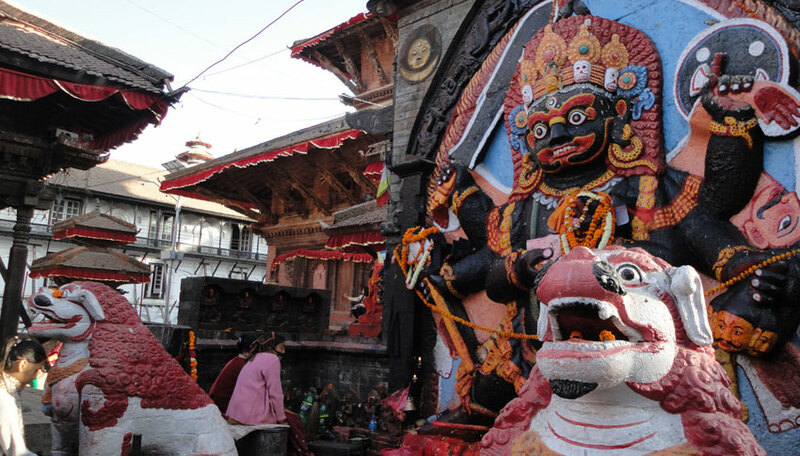 Kaal Bhairab and living goddess Kumar is yet another attraction of Kathmandu Durbar Square. Patan Durbar Square is located in Lalitpur City and one of the three Durbar Square in Kathmandu. The devastating earthquake of 2015 heavily damaged the temples and idols and still under renovation. Places to see here are Shikhar style architecture Krishna Temple, Bhimsen Temple, Vishwanath Tempel, Taleju Bhawani Temple, Golden Temples and more. 9:30 AM Pick up from your hotel. Our tour guide will be briefing you about the whole tour. Proceed to visit Pashupatinath Temple, Bouddhanath Stupa, Swoyambhunath Temple, Kathmandu Durbar Square, and Patan Durbar Square. After completing the sightseeing drop to your hotel. ​Trip finished here! Kathmandu Sightseeing by a private car, jeep, or by bus as per group size. Wants some modification on Kathmandu City Sightseeing itinerary? contact us to customize it.